A chameleon's need for dietary calcium is instilled early into the management repertoire of their keepers. Calcium deficiency isn't the only nutritional problem seen in chameleons but it is among the most common. It is diagnosed readily in patients showing typical, late-stage signs, but can be elusive in early stages. Most patients can be saved, but many diagnosed in latter stages fail to return to full function and visible reminders of bent limbs and twisted spines remain. Thus a goal of keepers and veterinarians is prevention of calcium deficiency -- a healthier option than treatment. A chameleon's only source of calcium is diet. From this source, calcium is absorbed into the body from the gastrointestinal tract and functions in cells within nerve, muscle, glands and organs as well as providing structural support in bone. In calcium metabolism, a chameleon's aim is to keep blood calcium concentration within normal limits to sustain heart and nerve function, even if it means suffering with soft bones and weak muscles. By the time weak tongue shots or toe clasps are noticed, calcium deficiency is already doing damage. If the disease is first noticed with swollen jawbones or broken legs, the patient is in serious trouble. For details on calcium metabolism see the May 2002 issue of Chameleons! Inside vertebrates, about 99% of the body's calcium is in bone. Invertebrates, in contrast, contain no bone and total body calcium is low. So low that most fail to provide enough calcium to chameleons. Crickets, mealworms, super worms, and fruit flies contain approximately 0.1% calcium on a dry matter basis. Wax worms contain less; silkworms contain about 0.2% when fed fresh mulberry leaves (less if fed commercial foods). The calcium levels in invertebrate prey typically provide one-tenth to one-twentieth of the amount needed. Data from our feeding trials suggest that calcium requirements of chameleons are in the ballpark of those for other insect-eating lizards - about 1 to 2% of diet. A few exceptions to the invertebrate/low-calcium findings exist. Earthworms analyze at about 1% calcium when their gastrointestinal tracts are filled with calcium-rich soil. Snail shells contain even more calcium. 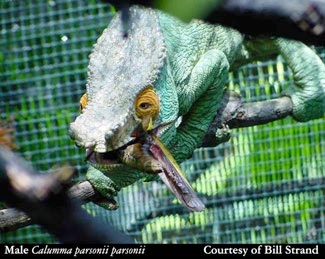 Attempts at providing only these natural calcium sources to chameleons usually fail because of problems with recognition of these prey as food, transmission of parasites, and creation of nutritionally imbalanced diets. I know of a veiled chameleon that readily accepts earthworms, and of collections in southern California and south Florida that consume snails weekly. For most keepers, however, other prey must contribute to total calorie intakes, and these will need supplementation with calcium. Supplemental dietary calcium may be provided as limestone (38% calcium) or as calcium salts -- carbonate (40% calcium), lactate (18% calcium), and gluconate (9% calcium). 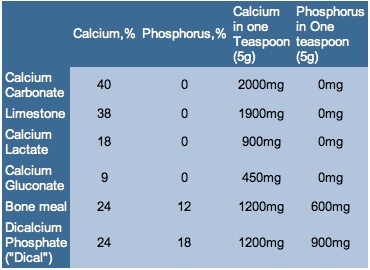 Calcium and phosphorus are supplied in bone meal (24% calcium, 12% phosphorus) and dicalcium phosphate (18-24% calcium, 18% phosphorus). Bone meal tablets vary in size. A small (aspirin size) tablet weighs 0.75 gm and provides about 180 mg calcium and 90 mg phosphorus. Products vary, so labels should be read carefully. Invertebrate prey contain relatively more phosphorus than calcium. Ingredient lists on labels will identify the specific form of calcium within the product. As calcium concentration in supplements decreases, the percentage absorbed tends to increase. Thus more calcium gluconate (containing only 9% calcium) is absorbed compared to calcium carbonate (containing 40% calcium) to achieve equivalent absorption of calcium. The body does a great job at regulating calcium absorption, and similar amounts will be absorbed regardless of the form. For example, using equivalent doses of 100 milligrams (mg), it takes an absorption of 50% calcium gluconate for 5 mg to enter the body (9 X 0.50). In contrast, it takes only 12.5% absorption of calcium carbonate to have 5 mg absorbed (40 X 0.125). Calcium supplements contain more than calcium. Impurities and contaminants, hormones and other substances may be present. For example, eggshell powder is occasionally available as a commercial supplement. Analyses of chicken eggshell powder for minerals, amino acids, and hormones determined that it contained high levels of calcium (401 mg/g) and strontium. Low levels were found for lead, aluminum, cadmium, mercury, vanadium, boron, iron, zinc, phosphorus, nickel, fluorine, selenium, copper and chromium. Large differences between products were found for fluorine, selenium, copper, chromium, and strontium. These differences were thought to be due to differences in chicken diets and environments. Protein was low; high levels of glycine and arginine were found. Detected hormones included transforming growth factor-beta 1, calcitonin, and progesterone. Below detection limits were estradiol-17beta and calcitriol. To the author's knowledge, chicken eggshell powder has not yet undergone controlled trials in reptiles and should be used with caution. Calcium also occurs in drinking water, with highest levels in hard water. In studies on humans, absorption of calcium from mineral water was significantly greater than calcium absorption from dairy products. In light of new, increased recommended intakes for humans, calcium-rich mineral water is suggested as a useful addition to diets of humans trying to achieve intakes of 1500 mg calcium/day. The role of high-calcium waters in chameleons hasn't been tested in controlled trials, and may aid calcium balance. However, water that has been softened should be used with caution. Softened water replaces calcium with sodium, and there are anecdotal reports of these high sodium levels being associated with mineral imbalance and fluid retention (edema) in chameleons. Concerns about lead levels in calcium supplements are justified, as analyses for lead can often be erroneously low, by up to 50%, or erroneously below detection limits. In one study, 136 brands of calcium supplements were analyzed, with calcium originating from bone meal, dolomite, and oyster shell, and calcium which was synthesized, refined, chelated, or non-chelated. Two-thirds of the calcium supplements failed to meet 1999 California criteria for acceptable lead levels. The pharmaceutical, synthesized, and refined products had lowest lead levels, and had the largest proportion of brands meeting criteria for acceptable levels. Calcium supplements sometimes include vitamin D. Cholecalciferol (vitamin D3) may be listed on food labels as cholecalciferol, animal sterol, D-activated animal sterol, irradiated animal sterol, or as vitamin D3. Don't assume that the term "vitamin D" in the label ingredient list is actually D3, for it may be D2 and unusable by chameleons. Different calcium supplements stick to prey in differing amounts. Next time we'll cover supplementation schedules and how these vary depending on your management and the products used.